I began my internship search during fall quarter of the ENV H 480 internship class. While a lot of the internships I found were through searching Google or Indeed, what helped the most was the Undergraduate Internships page on the DEOHS portal website. Accessing this page allowed me to become familiar with the different types of internships in environmental health, and prioritize which ones I wanted to apply to based on their location and deadline. When it came time to apply and fill out the applications, I was surprised by how tedious and repetitive some aspects were. I recommend starting this process as early as possible, and to double check that your answers are appropriately geared for the company or organization you are applying to. After applying to several internships, the one that I interviewed for first and eventually got was with the Environmental Health Research Experience Program (EHREP). To help prepare for the interview, I spoke with Hayley, the Internship Manager, about what to expect during the interview and to learn a little more about the internship. An integral aspect to getting the internship was expressing my passion for photography when asked if I considered myself creative, and providing some video examples I had made for school projects when I heard that they were looking for someone to produce video content on wildfire smoke. 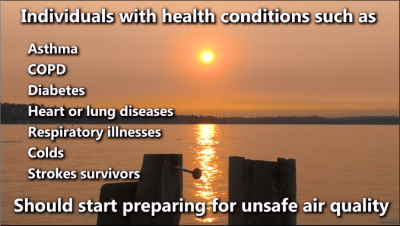 When I got my internship, I was placed with Public Health – Seattle & King County, where I produced smoke and heat safety videos in the Preparedness Section. In addition, I was able to shadow environmental health professionals once a week with Environmental Health Services and I also made smoke safety videos for the Washington State Department of Health as well. This entry was posted in Uncategorized and tagged 2018, internship, PHSKC, wildfire smoke on October 5, 2018 by deohsjob. Over the summer, I am participating in the National Environmental Public Health Internship Program (NEPHIP). The NEPHIP gives 35 environmental Public Health students the opportunity to intern at a local, tribal, or state health department. The application process is overseen by the National Environmental Health Association (NEHA) and they look at the written responses and at the students’ transcripts. I found out about this internship from the career adviser for Environmental Health at UW. I also applied to three other internships, but this was the internship that I was most interested in. I do not think that finding internships to apply for is hard because UW DEOHS maintains the internship page full of opportunities and sends out emails about new internships, so just keeping your eyes open helps. Many internships require a resume and a cover letter, or a written statement that answers a prompt, like the NEPHIP. For this program, I would advise starting the essays early so you have enough time to find feedback and edit your answers. The prompts require relatively short essays, so I think that the challenge lies in answering your prompt while also emphasizing your qualities concisely. I recommend having multiple people look over the essays, especially the Internship Manager because she knows what the evaluators are looking for in an application. Many internship programs also require a recommendation letter, so you should ask your professor at least two weeks in advance. Furthermore, I recommend “going with the awkward” and meet with them in person to discuss your motivations and how you think the internship would help you in the future. In addition to discussing these subjects with them, I would also recommend giving them a copy of your resume, so they can have some reminders of how awesome you are and what to include in their letter. When I applied to NEPHIP, I was surprised that they had a form for the recommender, and yet no interview for the applicant. I think these were both pleasant surprises and reasons why you should apply for this internship program. In the NEPHIP application, you can choose regions of the country where you would be willing to go for an internship. Finally, NEHA matches your application to the host health departments’ available projects and the region of your preference. I wrote my application essay about water quality and its impact on vulnerable communities, giving arsenic contamination as a personal example. I was matched to St. Mary’s County Health Department, Maryland, where I map arsenic concentration in the county’s drinking water and I modify outreach material to have a greater impact on the community. I do not know about other students’ applications, but I think that the matching process worked well, so I recommend applying for the NEPHIP if you are looking to work on an environmental health issue that you are passionate about and get paid for it. This entry was posted in Uncategorized and tagged 2018, arsenic, drinking water, internship, NEPHIP on September 13, 2018 by deohsjob. Meet Our Interns: Hayden K.
This summer, I am going to be an intern at the WA Department of Health (DOH). I will work at the Public Health Laboratory in Shoreline, WA. At the lab, there are multiple departments such as microbiology, environmental, media prep, bio toxin, chemistry, hazardous waste management, newborn screening, epidemiology, and more. I will be assisting the Microbiology Food and Shellfish Laboratory. I was on a search for a summer internship, and I thought this position was very interesting and would benefit me in the future since I want to pursue a career in the medical science field. I applied as instructed by emailing the supervisor my resume and cover letter and got an offer for an interview. I came for the interview and had the interview with the lab lead and supervisor. One week after the interview, I received an email from the supervisor that she would like to have a conversation with me on the phone. I talked to her on the phone, and she offered me the position. The oyster sampling site that I visited to collect a sample. During my internship, I will test oyster samples from throughout Washington for Vibrio parahaemolyticus. I will also assist the food lab by restocking items, preparing media and reagents, and entering data in the DOH database. Also, I will work on collecting environmental isolates of Vibrio parahaemolyticus from the positive oyster samples and run their DNA through PCR to find pathogenic strains. For the Vibrio parahaemolyticus testing, I will scrub and shuck oysters, process them through MPN dilutions, extract DNA through a Magna-pure machine, and enumerate by using real-time PCR. I have many mentors who will train and help me throughout the internship such as the supervisor of microbiology laboratory, lab lead, and microbiologists. I will be mostly be mentored from the microbiologists at the lab, since we will work on the same tasks and they are the ones who will be in the laboratory at all times. They mentor me through step-by-step procedures on food testing, working with reagents and media, and getting familiar with the Public Health Laboratory and regular job tasks. The lab lead and supervisor will mentor me on some of the projects that I will be having later in the internship. I am excited to gain hands-on experience on some of the machines that I learned about in my biology and chemistry courses. I will use the actual PCR machine to run samples from practical sampling sites. I will also get to see many different types of microbes and test food samples that are brought from an epidemiological investigation in the WA. I am also excited to see how my academic background as a public health student will be used practically at a public health agency. Since I will be testing real food samples that will be used to protect the WA public health, I am a little nervous about making sure my work is accurate. The results from our tests will be sent to the FDA or whichever agency that is working on testing the food, and will be used to evaluate the amount of pathogenic bacteria. This entry was posted in Uncategorized and tagged 2018, DOH, internship, Public Health Laboratory, shellfish on September 12, 2018 by deohsjob. Meet Our Interns: Mostafa E.
As my internship experience proceeds, I look forward to meeting more people from different departments and conducting as many informational interviews as I can. One of my main focuses is trying to understand the details of various positions within the agency to hopefully find something that may fit my current goals and interests. I think that I am progressing in this particular focus and being very proactive with all the work that I do at my internship. I scheduled a “ride-along” later this week with an Industrial Hygienist within the compliance sector, a field that I am currently interested in learning more about. This newly found interest led me to conduct more research on the various master’s programs within Occupational Health, and I am considering graduate school to gain a better specialization within this discipline. My current projects and tasks have been fairly broad as a result of working with various coworkers within the standards program. Most of the work I accomplished consisted of comparison and analyses documents that are required at different milestones of a project, mostly toward the end. Depending on the length of the amended rules, this task could get monotonous; however, it helps me become accustomed to the language style of rule writing. Another exciting project that I am currently working on is updating the asbestos removal and encapsulation rule. There is plenty of new and existing scientific evidence of the health outcomes from asbestos exposure, therefore it is crucial to modernize the rule so that it reflects the EPA model accreditation plan. These updates will maintain the level of expertise from the workers and supervisors who are trained to remove and encapsulate asbestos. Working on this project also gave me insight into the logic behind the technical services in DOSH. As we meet to manage the project, I learn the reasons behind the specific changes that are made for the benefit of the workers. One example is the added requirement of a refresher course after the expiration of certificates, allowing the supervisor and worker to restore and update their knowledge on safe asbestos handling. This entry was posted in Uncategorized and tagged 2018, internship, L&I on September 10, 2018 by deohsjob. This entry was posted in Uncategorized and tagged 2018, graduate, Industrial Hygiene, internship, SeaCast on September 6, 2018 by deohsjob.